Why is fluid therapy important? Normal body functions like digestion, urine formation and respiration create copious amounts of metabolic waste products of which the body must rid itself. The liver and kidneys have the noteworthy task of efficiently performing this waste removal function. When these vital organs are compromised by disease, metabolic waste products rapidly accumulate in the body and potentially exacerbate illness. Fluid therapy can help flush these metabolic toxins from the body and prevent further organ damage. Ingested toxins can also readily accumulate in blood and vital tissues; fluid therapy similarly helps flush the consumed toxins from the body. A common complication of illness is dehydration, and is particularly prevalent among pets that are vomiting and/or have diarrhea. Dehydration can cause major stress to the body and can lead to organ damage, low blood volume and blood pressure, and even death. Appropriate fluid therapy can help correct dehydration, improve blood pressure and support proper organ function. How is fluid given to my pet? 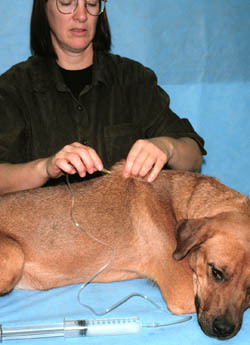 A dog being given subcutaneous (SQ) fluid. Note how relaxed the patient is during fluid administration. 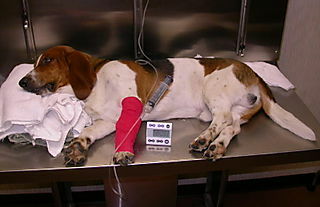 A dog receiving intravenous (IV) fluids. 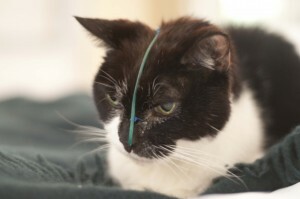 A cat with a supplemental temporary tube through which a veterinarian can provide water and food. Your pet’s veterinarian will advise you about the most appropriate route of fluid administration from your fur baby. What types of fluid can be given? Veterinarians have many different types of fluid from which to choose to help make a patient feel better. 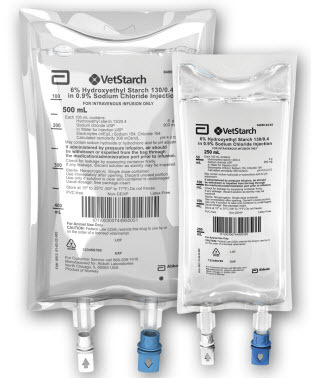 Ultimately the choice of fluid is dependent on many factors, particularly the pet’s primary disease process, the amount of acids in the blood, and electrolyte (i.e. : sodium, chloride, potassium, magnesium) concentrations. Fluids are commonly classified as either crystalloids or colloids. Crystalloids contain variable amounts of electrolytes, water and simple carbohydrates (i.e. : dextrose), and are used to either correct electrolyte deficiencies or maintain the status quo during treatment. Colloids are special fluids that contain large molecules that stay within blood vessels longer than crystalloids; these types of fluid can be helpful in patients who have low blood protein levels and/or who have bleeding abnormalities. The primary benefit of fluid therapy for patients is to support of normal body functions. A veterinarian will perform a complete physical examination and some non-invasive blood and urine tests to determine the best type fluid for a pet and to select the most appropriate route of administration. Fluid therapy is truly a helpful and minimally invasive intervention to help maximize a pet’s likelihood of making a meaningful recovery from illness.